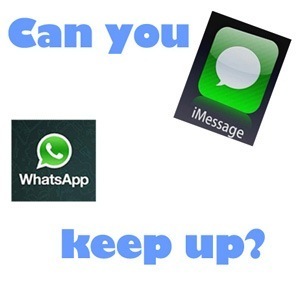 I have recently been asked how to monitor WhatsApp and other instant messenger services. There are actually some spy software programs which can give this level of monitoring, depending on which service you need to cover. You might be asking why would this ability be important? To answer this you need to understand how the different messenger apps work then we can proceed to figure out where the monitoring software comes into the picture. Below, I’ll list some of the best apps for monitoring Whatsapp and others … so keep reading! This is part of my Ultimate Guide to Phone Spy Software – check that out too. Covers the widest range of social sites and chat services. It works well on Whats. simply collects everything on both sides of the conversation – and now you can actually listen to calls made using WhatsApp. The only program that can do this right now – Full review of Flexispy here. Another good service covering a good selection of chat and social sites. Again all conversations are collected and reported. They also have a No Jailbreak service for the iPhone which will spy on Whatsapp messages. See my full mSpy review here. There are new instant message services being released all the time and the big ones like WhatsApp are very popular, especially amongst kids. Such chat services allow the users to send messages as well as data files without incurring text costs. This mode of communication allows the users to send photos, music and videos for free. It also allows people to carry out unlimited free chats. The monitoring is usually done by parents who are concerned about the activities of their kids. The parents may not be able to keep up with all the services. In the past spy software products could only monitor regular SMS text messages and whatever the kids did with WhatsApp etc could not be monitored. Now several companies can give you access to their use of messenger type services. Here are some of the main messenger services which can be monitored. Note that none of the cell spy software programs can monitor them all so you need to choose the program for your specific needs. WhatsApp Messenger is currently the most popular app among young phone users. It has the ability to carry out cross platform communication. You can obtain it from Google Play Store for free and it is available for Nokia Smartphones, BlackBerry, Android, Windows Mobile and iPhone. This allows you to send messages between different platforms so long as the other party also has the app. You can even send messages from a PC to a cell phone. BlackBerry Messenger – This is an instant messaging service that is available for users of BlackBerry phones. GTalk – This is Google’s own chat application that works in a similar way to WhatsApp. It is also has the ability to work across different platforms. iMessage – This is an instant messaging service that is able to work between Apple devices – iPhones and iPad. When communicating with someone who uses a non-Apple phone then they get an ordinary message. If you are trying to monitor your child’s cell phone use and they are now using these chat services instead of regular texts – you are not going to have any access to their messages. Unless you use spy software which can target their favorite messenger service. Up until very recently this was impossible. For many people just monitoring their cell phone in the old way is fine. It can give a good overall picture of what they are up to. But if they are using these services all the time you may be missing vital information. Because it is basically free text messaging, kids are using them a lot. It is quite hard for the spy software developers to keep up with all of the apps being used. Hopefully, the advancement in technology will lead to the discovery of better software that will be able to track online communication across different platforms. There is no solution at the moment which can actually be classified as complete – covering all messenger services. However, there are some which are highly rated. Flexispy Software – This is the top of the range product right now – You can listen to actual voice calls made using WhatsApp Messenger. They also have the largest number of supported services- A total of 13 and counting different apps and services can be monitored using Flexispy. Read my main FlexiSpy Review and see what else makes this one stand out. mSpy Monitoring – have been working hard to keep up with the range of services, they cover Whatsapp well and have a decent range of other features. MobiStealth – This allows you to view activities taking place Facebook, WhatsApp and Viber – for Rooted Android phones and iPhones. Android phones which are rooted also have the ability to track activity on Twitter. You can also monitor activity on BlackBerry Messenger, Windows Live Activity and GTalk. People who use iPhones are able to monitor iMessage and YouTube which allows them to see the videos viewed. As things stand at the moment, there is no software which has the ability to cover all the messaging apps. The available options still need to be improved and upgraded. Flexispy are without doubt the best option at the moment, covering the most services but mSpy are also worth comparing. It is important to match the spy software with the services you need to monitor. One common question keeps popping up about how to spy on WhatsApp Messenger – do I need to root my Android device? The answer is yes for all of them! You can find out more in my Rooting Android Guide – but be aware that this is necessary for all WhatsApp spy programs. There is a lot of competition at the moment between the various spy software companies as they try to monitor more messenger services. You really need to keep an eye on developments and find the best spy software for your needs. Need to monitor Skype – or monitor Viber Chat messages – I have articles about that! is there a sofware which monitors whatsapp on a blackberry phone? I’m afraid not at the moment. You can monitor BBmessenger but not WhatsApp on a BlackBerry. Will Flexispy or mSpy let me see the actual messages – or do they just log that a message was sent. Will either show pictures sent and received. Thanks. Both will let you see the actual messages including any pictures sent on Whatsapp etc. You get the log details as well – time stamps and contact details. Yes rooting is needed to be able to monitor Whatsapp and all of the other social / chat services. All of the spy software programs require root access (rooting) for Android to monitor these types of apps. Does this software work on windows phone tio? Some programs do cover Windows phones – FlexiSpy is one – but check the OS version first. Flexispy and mSpy both monitor Whatsapp – check my main reviews to see the difference in other features and prices before making a choice, but both will do what you need. If i use these apps…would the person using the Android i am monitoring will get any notifications? Or by any chance… will know that im mmonitoring his phone? The good ones are very well hidden – no notifications, they are hidden from the running processes – they are rarely found. The companies work hard to keep them hidden – spy software that is visible is just software. You need to install it on your kid’s cell phone physically. You download it to the target phone and activate the software – then you can view all activity using the online control panel (accessed by any device).